Since 2009, West Side School has been steadily updating the instructional classroom technology available to our teachers and students. One particular instructional tool we have implemented into four classrooms are interactive white-boards made by Promethean (we call them our “Promethean Boards”). Our Promethean Boards are mounted in front of our traditional dry-erase boards and are used in conjunction with our ceiling mounted projectors. Our teachers utilize their Promethean boards in their daily lessons. Second grade teacher Kathy Mullins said, “It brings our learning to life. The students and I benefit greatly from it. I use the board to introduce new topics and review previous lessons. "For example, I utilized the Promethean board to introduce adjectives. It gave students an opportunity to move and interact with the topic. At first, I presented a definition and example of adjectives on the board. Students were then able to circle or highlight the adjectives in the sentences using the special Promethean pen. Another great benefit of the board is to review previous lessons through fun games over a specific topic or subject. Students cannot wait to have their turn with the Promethean pen." Middle grade social studies teacher Melissa Anderson admitted that she was hesitant when approached about installing a Promethean board in her classroom. However, she now says, “It has been one of the best contributions to my classroom. I use it in EVERY CLASS. Before the Promethean board, I could not teach how I now teach. Prior to the board, I used an overhead projector in all of my classes. I would make copies and then hope that everyone could see. The Promethean board allows me to leave the projector copies behind. I also have an Interwrite Tablet that allows me to stand at the back of the classroom and still write on the board. It has helped with my classroom discipline by freeing me to walk around the room!!! • Daily Edits - I place a “This Day in History” on the board which contains errors, and the students are then asked to come to the front to make corrections. They love being able to use the board. • This day in history clip. These examples of Promethean board use display a portion of the wide variety of technology options available to our teachers. 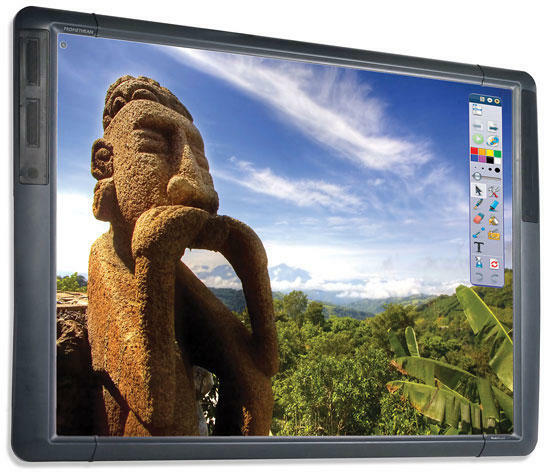 Unfortunately, each Promethean board costs approximately $1,500 per classroom. Due to the cost, to date we have only been able to install four Promethean boards. However, our intention is to utilize our available resources to install this tool in our remaining classrooms in the next 18 months. With our student’s knowledge of technology increasing daily, we want to expose every West Side student to today’s instructional technology on a daily basis.